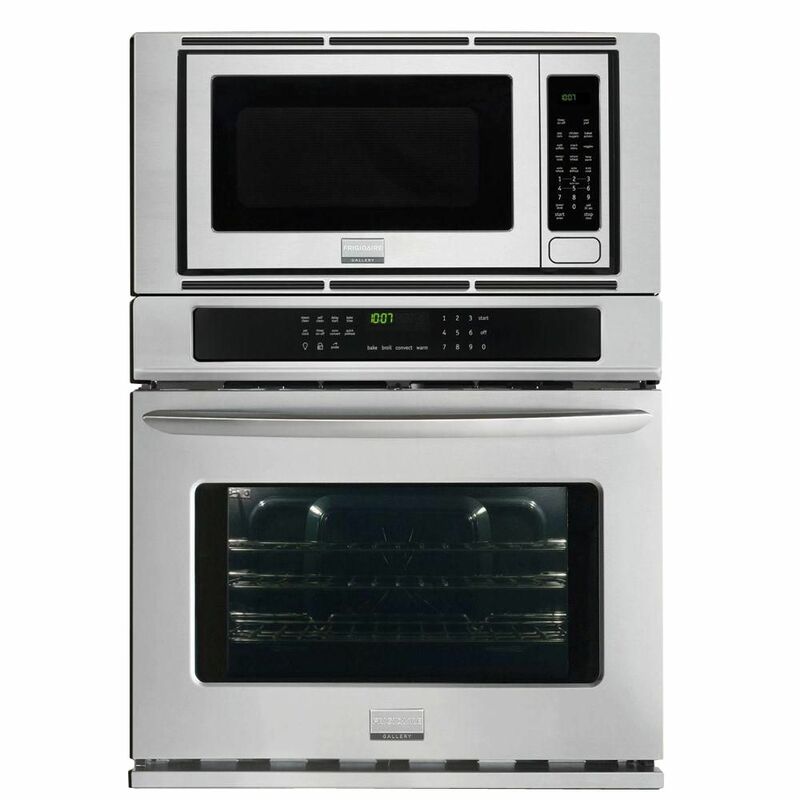 The Frigidaire Gallery 30-inch built-in electric wall oven with built-in microwave features a large 2.0 cu. ft. 1,200W microwave oven with Auto-Cook Options, Auto-Reheat Options and Auto Defrost Options, for the utmost in cooking flexibility. The lower 4.4 cu. ft. electric wall oven features True Convection technology with a third convection element for faster, more even multi-rack baking. The oven also offers a variety of cooking modes and options including Convection Roast and Keep Warm settings. The lower oven features a Quick Preheat option, allowing you to preheat the oven in just six minutes. Gallery 4.4 cu. ft. 30-inch Electric Wall Oven with Built-In Microwave in Stainless Steel The Frigidaire Gallery 30-inch built-in electric wall oven with built-in microwave features a large 2.0 cu. ft. 1,200W microwave oven with Auto-Cook Options, Auto-Reheat Options and Auto Defrost Options, for the utmost in cooking flexibility. The lower 4.4 cu. ft. electric wall oven features True Convection technology with a third convection element for faster, more even multi-rack baking. The oven also offers a variety of cooking modes and options including Convection Roast and Keep Warm settings. The lower oven features a Quick Preheat option, allowing you to preheat the oven in just six minutes. Gallery 4.4 cu. ft. 30-inch Electric Wall Oven with Built-In Microwave in Stainless Steel is rated 4.4 out of 5 by 140. Rated 5 out of 5 by Erika from Great oven at a great price. I am very happy... Great oven at a great price. I am very happy with my oven. Rated 5 out of 5 by Maurdeib from Easy to install and use. Fit beautifully into the cabinet... Easy to install and use. Fit beautifully into the cabinet with two persons lifting. Love the clean lines and touch controls. Rated 5 out of 5 by Vicki from It’s great so far.... It’s great so far. does this unit come in 2 separate pieces or is it one unit?